As a blogger, when I started out, this was the biggest question that plagued my mind. I knew though there were amazingly beautiful images on Pinterest and Google images, I could not use them as they were copyright. Also as a creative person myself, I knew how painful it is to see your work being used, without giving you due credit but we also know how long form content tends to get better visibility because of images. Now check out some facts below that will make you realize the importance of images in posts and websites. As a blogger, small businessman or a soloprenuer, you will realize why having images on your site means getting visibility and business. People unconsciously decide if a site is interesting for spam based on its design, layout and images. As a small business or a newbie blogger it is tough to find readers and audience, hence you can’t afford to ignore images. While most of the images are copyright, the few sites that you might know which offer free images, might not always have the kind of images you are looking for. 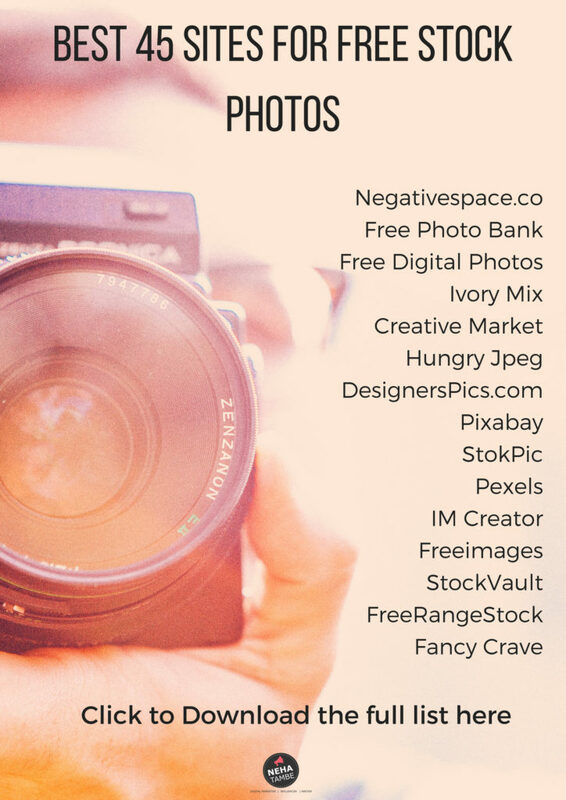 In such a scenario a ready reckoner or a list of sites that offer free images is something that comes in handy. I know this struggle very well and hence I have created a downloadable list of sites which offer free images. Subscribe to get your list in your inbox. Once you know where to find the images the next step is to use the correct images. You might have great photos available but if you are not using them well, they will not have the impact that you are looking for. While all images will be high-definition, what we need to see is do these images add a story to your offering. If the images scream stock photography, it might not have the desired impact especially in a blog post or social media marketing. As social media is more about user content or content that looks real and authentic, an image that is perfect for a hoarding might not do well here. When I say authentic images, I don’t mean the images will be photoshopped or changed technically. I mean the feel or the emotions that are being radiated from the image should be authentic. So if you see an image that showcases a smiling tele-caller you know it is a staged and modeled image. Such images will work great for websites, advertisements or hoardings but if you are using them on your blog or solo solopreneur offering, they might not seem genuine. As these images are not shot by keeping your content in mind, you need to be extra careful when choosing the images. Look for images that add something to the message that is being communicated to the audience. If you are talking about tips to work from home, check for homely office /workspace images. This will help establish your message more strongly in the minds of your audience. For a freelancer post, an image of a corporate office will add no value, but might even put off genuine readers as they might not consider it relevant. Just as your blog has a unique voice, so does your images. Be sure to see it the image works well with your content and your audience. If you are a mom blogger talking about mindful parenting, yet all your images have a negative undertone, then it might not attract the audience that you are looking for. Similarly, if you are talking about women entrepreneurs then having a desk image with just books might not be a right fit. As an entrepreneur we are looking for subtle references to it with a to do list, well maintained desk, books arranged well, flowers or some small memento etc. While the images are free to download, there could be conditions attached and it is important to check them before using the images. Some offer images with no conditions, while some make it free only for non-commercial use. Some images might want you to credit the image creator, or some might want you to include a link back. Whatever the condition, do give it a read and fulfill the same to avoid any issues in the future. As a social media marketer and a strategist, I have seen closely the effect that a well-designed image can have on the audience. A picture can say a 1000 words is not just a phrase but a sentence with a lot of truth in it. As you start on your journey of a blogger or entrepreneurs, you will quickly realize that stock photos when used correctly can have a great impact. Need similar tips, suggestions and a tribe to grow your newbie blog? 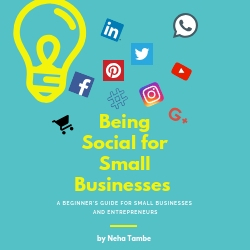 I have a Facebook group that is specific to such newbie bloggers to help them take their blog to the next level. These are a few tips to think of while choosing your images. I would love to hear your views. Do you use images in your posts? How do you find them impacting your statistics. If you have used images in any creative way, don’t forget to share them in comments and you might be featured in the coming posts. I knew few sites only but this list is very helpful. Sometimes for our post we take images from google, but ideally we should use free images. So really good post Neha. Thanks for this. I never really used to think much of it in the first few years of blogging. Realised the value of this only in these last few years. Excellent post, and you had covered all points so wonderfully. learnt a lot as always. I use pixabay and Flickr a lot for the images for my non-recipe posts.but whenever I use them,I give credit to the photographer, mention any licenses of applicable. I will explore the others too in the list. Thanks for the compiled list. This is an informative post. 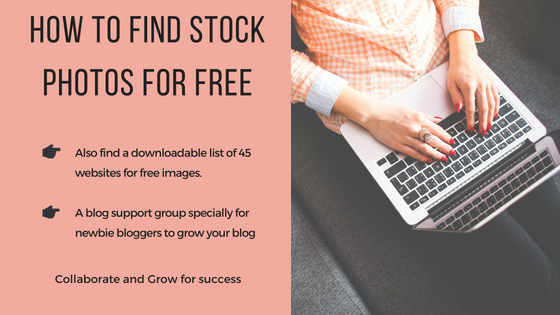 Have bookmarked it and will check out these sites for free stock photos. Thanks for sharing, Neha! Very informative Neha. Great tips to choose a good image. That was one of the most insightful posts that I’ve read today. Really very helpful & didn’t know about the model release point. Now this is a very useful post. I’m a product photographer and a blogger. I was looking for sites where I can sell my work. I hope these sites purchase images too (for those who want to buy/sell). I have purchased stock photos in the past and think if I can monetize my images for some extra cash. Stock photos are very useful but finding one without copyright is hard.. I always try to give the owner due credit! Nice post! I knew few names but I didnt have such big list. Thanks for sharing dear. Its going to help us all a lot. Hey that is an. Awesome list. Downloaded the same for future reference. I completely agree how important good photos can be. This is a great resource for a blogger. I am bookmarking this for future reference. When I was looking for the cover of my book this was the major issue I faced. I wanted to make the cover on my own without publishers interference. Though I managed to do well with the cover yet it would have been great if it were from one such site. Amazing and informative post. All the websites are best for the bloggers. I would like to include these resources for the future preference. Great thoughts. This is a very helpful post for bloggers who need to be aware of correct photo usage on their sites. All these tips are necessary and useful for a blogger as it helps us to keep our blog and pictures copyright free and makes it look interesting. This would be a helpful information to bloggers and e-publishers. This is one of the most challenging aspects in blogging today.